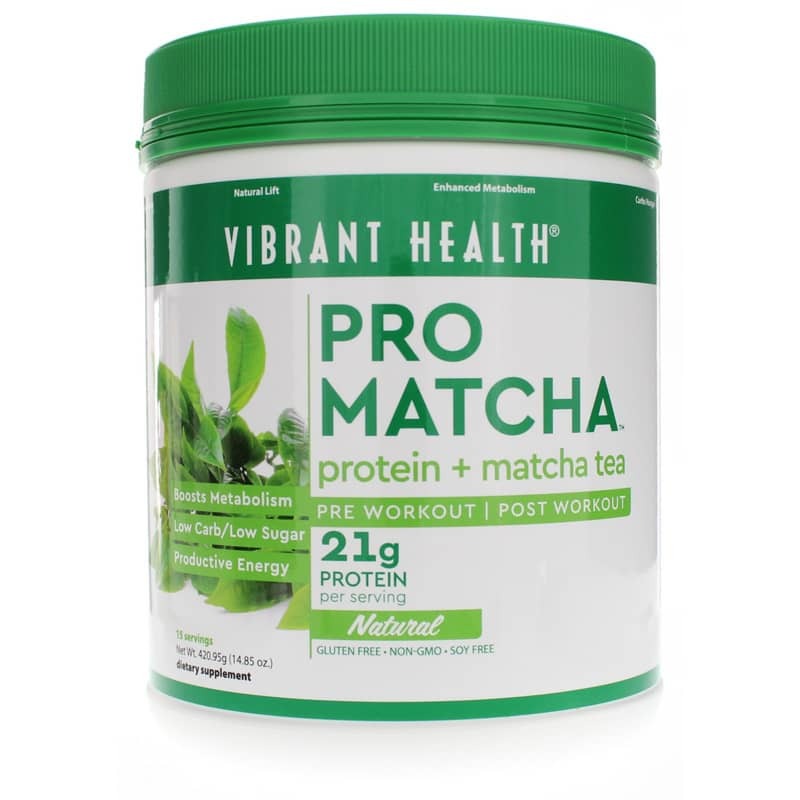 Pro Matcha in vanilla from Vibrant Health is a delicious whole-food, plant-based protein powder featuring Matcha tea for extra energy and antioxidant support to fuel your workouts and your health. Whether you're looking to support your workout or just to get some delicious and convenient energy to get you through the day, Pro Matcha has the ingredients you need. This vegan-friendly protein powder delivers 21 grams of protein per serving plus amino acids, including all essential amino acids and even branched-chain amino acids. Pro Matcha contains a balanced, plant-based protein blend of algal, sacha inchi, yellow pea and spirulina. This combination is low in carbs, helps fight cravings, contains omega 3, 6 and 9 fatty acids, supports immune health and is easily absorbed. 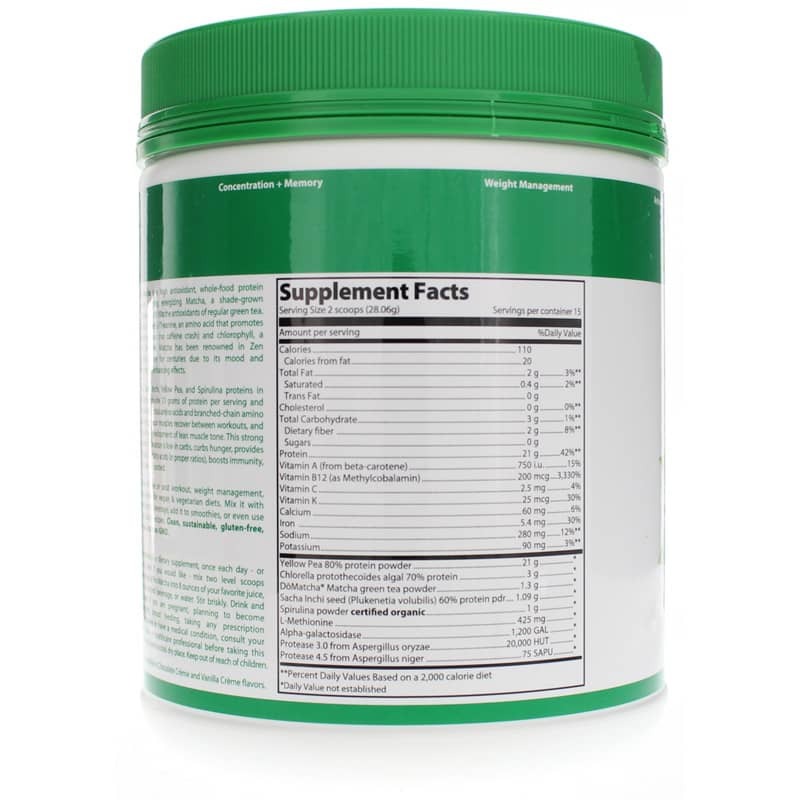 Plus it's great for supporting exercise recovery and muscle tone. What really sets this protein powder apart is a special super ingredient: Matcha powder. A shade-grown Japanese tea, Matcha contains more antioxidants than regular green tea, including naturally detoxifying chlorophyll. Matcha also provides the amino acid L-theanine, which supports relaxed alertness without putting you on the road to a caffeine crash. In addition to quality protein and a little antioxidant boost, Pro Matcha also contains added nutrients, like vitamin B12, which is crucial for energy. 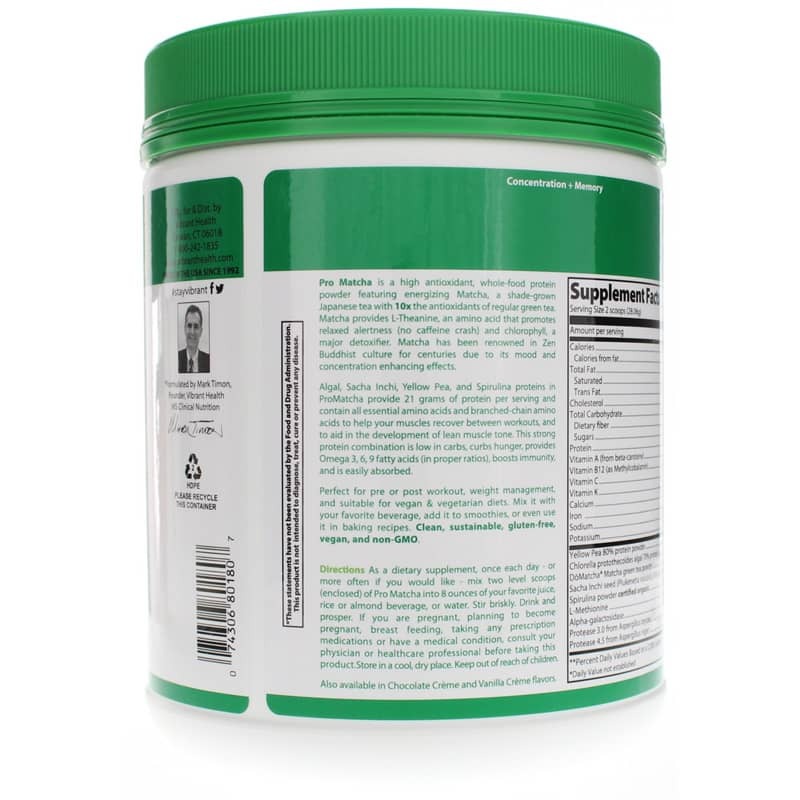 You'll also find Protease for optimal digestive support. Use Pro Matcha before or after workouts, to support your weight loss goals or just to get extra energy and nutrition. Order today. Other Ingredients: natural vanilla cream flavor (1.5g). Contains NO: gluten, soy, GMOs. Vegan. Adults: As a dietary supplement, once each day, or more often if you would like, mix 2 level scoops (enclosed) of Pro Matcha into 8 ounces of your favorite juice, rice or almond beverage, or water. Stir briskly. Drink and prosper. If you are pregnant, planning to become pregnant, nursing, taking medications or have a medical condition, please consult your healthcare practitioner before taking any dietary supplement. Keep out of the reach of children.